For the past four years, a grazing system consisting of winter wheat and crabgrass has been managed near Stillwater. This system is commonly utilized by beef producers in Oklahoma who choose to focus their efforts in beef production with little or no interest in grain production. It is particularly ideal for soils where grain production is limited by highly irregular or low water storage capacity, which limits grain production. It is certainly not recommended for producers interested in summer crop production, as crabgrass can be aggressive and there are limited postemergence herbicides available for controlling this plant in crops that are not glyphosate tolerant. However, crabgrass can be a resilient forage species for a grazing system to take advantage of rainfall received during the summer months. This report describes what was learned in managing this system for four years. In 2014, the rotation was initiated with the broadcasting of red river crabgrass seed with a topdress nitrogen application in early March. The seed was mixed with urea fertilizer at a rate sufficient to apply 7 pounds seed (pure live seed) per acre with 150 pounds urea/acre. The mix was applied using a spinner spreader. However, because the seed is a very light material, it does not spread as wide as the heavier urea prills. In an effort to achieve a better seed distribution pattern, the metering system was reduced to apply 75 pounds urea per acre and cut the return path interval to 50 percent of the design width. Specifically, the spreader was meant to spread at a 40-foot width, but a 20-foot spread interval was used, such that fertilizer applications overlapped by 20 feet on each pass. Overall, this was sufficient in distributing the crabgrass seed. However, it would be more effective to use a pneumatic dry fertilizer spreader, if available at a local fertilizer supplier. A pneumatic spreader will provide a more uniform distribution of the seed when thoroughly mixed with the fertilizer. It should be noted that this system was managed without tillage, so crabgrass seed has yet to be incorporated and has propagated annually from volunteer seed without spring tillage. It is also important to remember not to mix the seed and fertilizer until just before applications, as the fertilizer will reduce seed viability if it remains in contact for a prolonged period of time. Crabgrass establishment is affected by timing of wheat termination. This affects the resulting grazing days available, as well as the uniformity of the crabgrass stand. The decision as to when to terminate the wheat must be made based on the further need for the wheat forage versus the need for summer forage. Typically, it was planned to terminate wheat no later than the first week of May. Depending on the temperatures, rainfall and degree to which the wheat has been grazed, start to scout the field the 15 to 20th of April. Each factor can influence the soil moisture and temperature conditions, which will impact germination. Most literature suggests that crabgrass can germinate when the average daily temperature in the top 1 inch of soil is approximately 60 F (Virginia Tech 418-004). Ideally, wheat is terminated prior to this condition to promote emergence and to prevent terminating the newly emerged crabgrass. When scouting, look for the first sign of emerging plants as shown in Figure 1. Termination of wheat can take on many forms. Wheat can be cut for hay or grazed out, then terminated through chemical means or tillage. The advantage of cutting wheat for hay is that the surface residue condition left behind is uniform. Also, the growing wheat used for hay production tends to be more competitive against late winter and spring emerging weeds, compared to grazeout, which was observed to reduce the competitiveness of the wheat. In contrast, the grazeout approach brings the animals to the forage and thereby reduces costs. To maximize crabgrass performance, grazeout or haying must be completed prior to the target termination of the remaining stubble. Also, delays in hay baling and hauling of bales out of the field must be minimized. It is important to weigh the need to terminate the remaining wheat stubble with the potential of killing the emerging crabgrass. If the wheat field is weed free and hay is harvested, it may be possible to be successful with crabgrass establishment without terminating the wheat, as it has limited regrowth after haying. However, if the field contains substantial cool-season grassy weeds, which are often more resilient to haying, the field will need to be terminated with tillage or herbicide. The system in Stillwater has been managed without tillage since 2014 and seems to be successful; however, there are no direct comparisons of no-till versus tilled management practices. As with all cropping systems, no-till management provides for lower horsepower and labor demands, compared to using tillage for termination. No-till also provides the added benefit of reduced evaporative water loss after termination of the wheat. Utilization of tillage for wheat termination may be advantageous for some growers and is a viable option, depending on the availability of equipment. 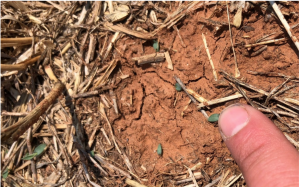 Crabgrass provides opportunity for a high-quality summer forage that can reseed itself, which reduces costs after initial establishment compared to many other warm-season forages such as millets, sudangrasses and sorghums. Furthermore, crabgrass does not accumulate prussic acid. However, while rarely toxic, it can accumulate nitrates. As with most forage crops, yield and quality are dictated primarily by the availability of water and nitrogen and the growth stage of the plant at harvest. Yields typically range from 1 to 4 tons. Crabgrass is typically ready for grazing at 30 to 45 days after emergence given favorable conditions. The University of Arkansas cooperative Extension service provide an excellent overview of the impact of growth stage on forage yield and quality in FSA-3138. This report suggests that the crude protein can be as high as 21 percent during vegetative growth, but will decline through reproductive stages to as low as 16 percent, which still meets the requirements for stocker cattle and cows. As with all crops, proper fertility will enhance crabgrass performance. The crop is reported to do well in pH levels ranging from 5.5 to 7.5. Soil tests should be routinely collected to assess the sufficiency of phosphorus and potassium levels. As mentioned, the availability of nitrogen will dictate yield and quality or the resulting forage. A rule of thumb is that 50 pounds of nitrogen per acre must be available in the soil or through supplemental fertilizer for every ton of hay containing 16 percent crude protein. In Stillwater, 75 pounds of nitrogen per acre is applied after full emergence of crabgrass in late May to early June. If broadleaf weeds are present, this nitrogen is combined with an appropriate herbicide. Nitrogen availability is then monitored with nitrogen-rich strips (see CR-2277 Applying Nitrogen-Rich Strips). If these strips become apparent, the need for further forage production and quality is assessed against the need to prepare for fall forage planting. The first step in transition to fall forage production is termination of the crabgrass. 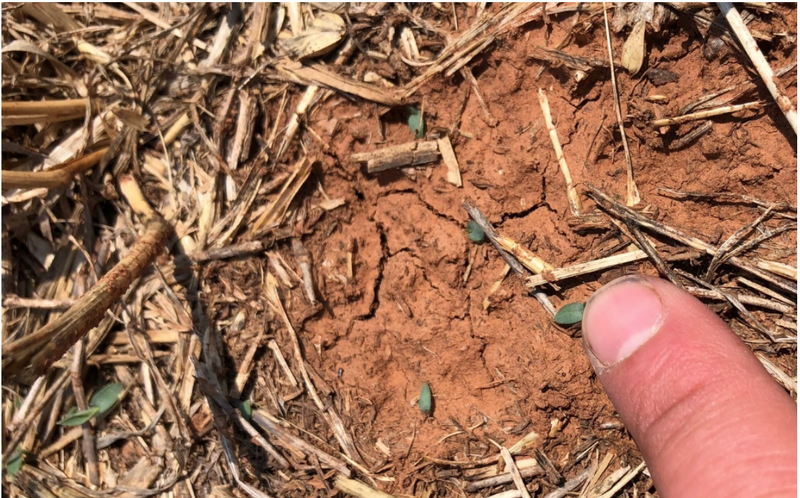 Typically, crabgrass can be managed to have a target termination date of August 1, this provides approximately 30 to 45 days of soil moisture profile recharge prior to planting in September. Many producers utilize tillage for termination but success has been seen with no-till winter wheat in this system. It is critical that sufficient residue be left behind to allow for good seed bed conditions. Often, people want to know “how many pounds of residue do I need to leave behind?” It is not the weight of residue or even the thickness that is important. The key is to leave behind a mat of residue that provides as near to 100 percent ground cover as possible. Typically, this is easy to accomplish with crabgrass, as it is commonly present in high densities unless the field is overgrazed. Haying generally results in increased crabgrass residue, but with thoughtful grazing management, adequate residue can be achieved with either strategy. Managing the crabgrass through termination to provide a uniform ground cover that results in as near to 100 percent cover is critical to successful no-till planting of this system. Bare ground will dry out faster after a rainfall event during the heat of September, resulting in a short planting window, especially with hot, dry weather. Overgrazed conditions will result in increased soil compaction, which causes greater difficulty in penetrating the soil and accomplishing good seed-to-soil contact and proper seed depth. It is useful to remember that the aboveground growth of a green growing plant is matched by as much or more root mass underground. This root mass serves as a skeletal structure for the soil to prevent compaction. If the ground is covered at termination, it’s most likely full of roots that will improve planting conditions compared to bare ground. As mentioned earlier, the amount and quality of forage produced from the crabgrass as well as the winter wheat is controlled by the availably of water and nitrogen for crop utilization. No research has been conducted to specifically evaluate the water dynamics of this system, but other similar systems have been evaluated with respect to forage productivity resulting from different management scenarios for continuous winter wheat production. 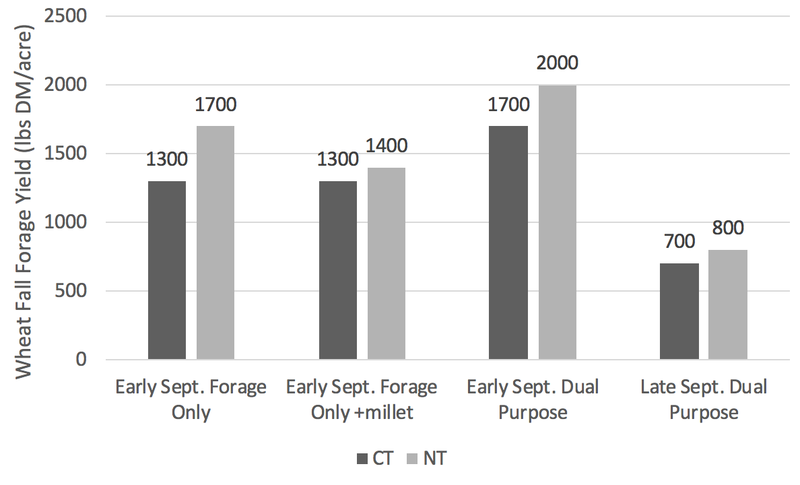 A study was conducted to evaluate the inclusion of German millet in a continuous winter wheat forage only system for both no-till and conventionally tilled programs during 2002-2005 at locations in Kingfisher, Garfield and Alfalfa counties (Decker et al. 2009). The impact of tillage on forage productivity is presented in Figures 2 and 3. 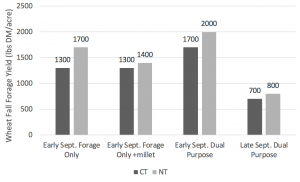 First, notice that no-till management typically increased forage production in each scenario. Secondly, the data shows that early September plantings are superior to late September. Third, increasing amounts of forage removal from the system decreased wheat fall forage (Figure 2). However, there was a smaller impact on spring hay production (Figure 3). Inclusion of the millet, which is similar to including crabgrass, reduced fall forage, but with the benefit of producing approximately 4,000 pounds dry matter per acre as summer forage (its noteworthy that the no-till system provided for 15 percent more millet forage as compared to the conventional tilled system). Figure 2. 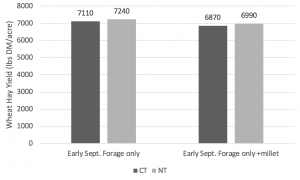 The average fall forage yield measured between 2002-2005 in Kingfisher, Garfield and Alfalfa counties in wheat planted in early September or late September, utilized for spring grain or hay production on conventionally tilled soil or no-till conditions. One of the early planted forage-only treatments was used to grow German millet in the summer season. Figure 3. Wheat hay production as impacted by conventional versus no-till soil management and the inclusion of German millet production between winter wheat crops. These results are impacted by differences in soil water dynamics. In short, if dry conditions are experienced after crabgrass termination, there will be a negative impact on fall forage production, but little impact on spring hay production or forage available during spring grazeout. The same is true for the crabgrass phase if choosing to delay termination of the wheat to extend the spring grazeout period. This decision will decrease the potential productivity of the crabgrass and grazing days it provides. Lastly, no-till management minimized evaporative water loss that can then be available for forage production. Cutting this forage resource for hay increased the system demand for nutrients compared to grazing. Therefore, it may be prudent to rotate the production of hay, or at least be aware of the increased nutrient extraction that hay production imposes, and plan to assess soil nutrient status and correct deficiencies as they develop in different fields. It also may be prudent to experiment with termination dates or even rotate the termination dates on different fields. For example, a portion of wheat forage may be terminated early to ensure sufficient soil moisture for early crabgrass production, while a portion may be used to extend grazing days into the late spring. This same philosophy may be used on the crabgrass production phase where portions are terminated early or even fallowed during the summer to provide risk management against dry autumns, were the stored soil moisture will increase probability of success for fall forage production. Crabgrass is an aggressive warm-season annual grass that can invade cropland or perennial forage production systems. However, this annual grass species is commonly found throughout the state and can serve as an excellent summer forage resource in rotation with wheat. It is a prolific seed producer, and as such, will typically reseed itself for sufficient production given adequate near-surface soil moisture in the spring. Many growers utilize crabgrass as a resource if it happens to emerge after wheat grazeout, but experience shows that, with minimal effort, the success of crabgrass forage production can be enhanced by simply terminating wheat earlier. This must be balanced with the need for forage in the spring grazeout or hay production phases of the winter wheat season. Decker, J.E., F.M. Epplin, D.L. Morley and T.F. Peeper. 2009. Economics of five wheat production systems with no-till and conventional tillage.